One of the things that I love about reading books with BookBairn is that I can see that books inspire her play. When she puts her dolly in the pram she is "off to the library, mummy"; when she tucks her toys up in bed she reads them a story; she gathers all her Peppa figures around and plays 'Bookbug', singing the songs from our library sessions. She also uses the stories to inspire her play. I've seen her make Nibbles the book monster eat her books, she uses her finger puppets to act out fairytale stories, she feeds the very hungry caterpillar lots of food from her play kitchen. 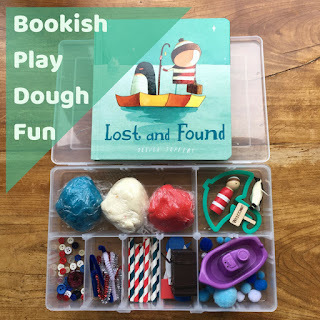 When BookBairn opened the box she really enjoyed getting the play doh out and exploring the three different colours and the smells. She quickly realised that this was no regular play dough box: it's "Penguin and the Boy play dough, Mummy!" and she put the characters straight into the little boat to sail off to Antartica. She loved seeing all the different loose parts that would support her character play. She wanted to roll out the dough to make the white snowy lands of Antarctica and the blue into the sea with "waves as big as mountains" (her favourite quote from the book). She quickly moved on to use the straws to make a castle for the penguin and pushed the buttons into the white dough to make stepping stones. I have never really seen her play like this with play dough before - perhaps it's because I left her to play without trying to lead her. I sometimes can't help myself! But it was so lovely to see her using her imagination. We got lots of other little bits including an umbrella shaped cutter which we used with the red dough to make a boat for the penguin to try to find the boy and re-shaped the white dough into an iceberg that they would be sailing around. Not only was her play much more creative than I had seen it before it was also wonderful to here her using all the rich vocabulary that she had picked up from the story! She made the characters talk to each other, she explained and described all the things that she was building and creating. Such rich and valuable play! 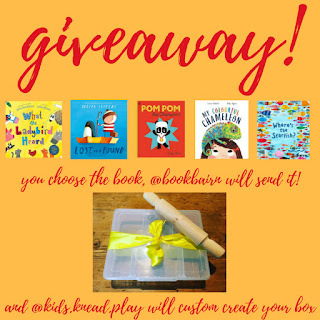 If your child has a favourite book that you want to extend into their play 'Kids Knead Play' make custom boxes to suit your child's interest in a variety of sizes and if your bairn isn't really a huge book fan, they also make cools boxes on lots of other kid-friendly themes like dinosaurs, jungle, construction sites and or older kids they have great letter and number boxes too. And some wonderful news is that we are collaborating with them to do a giveaway! Happy book-based play and reading! 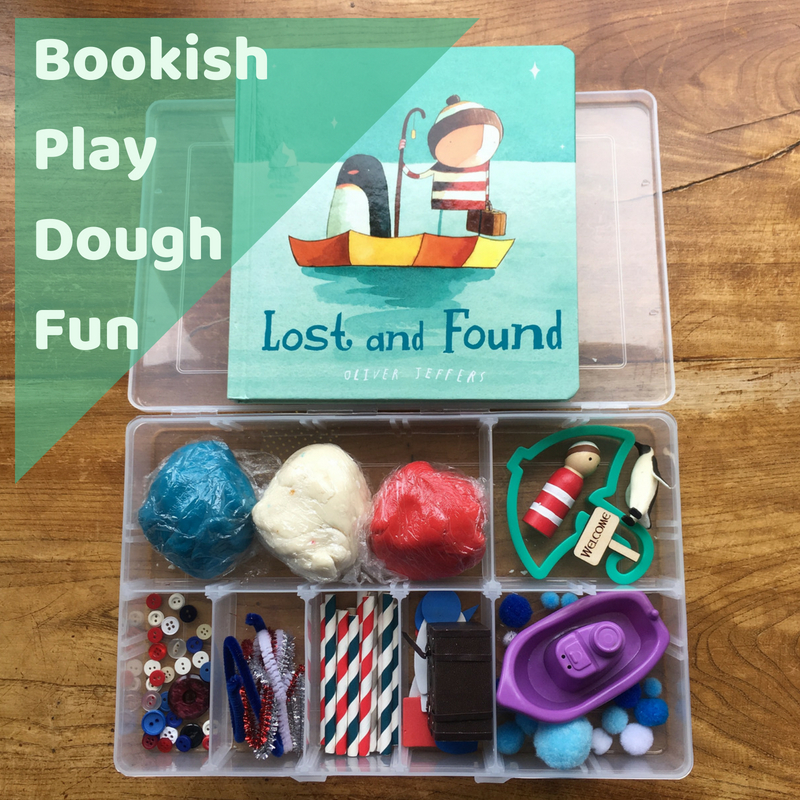 Mummy, BookBairn and Kids Knead Play! 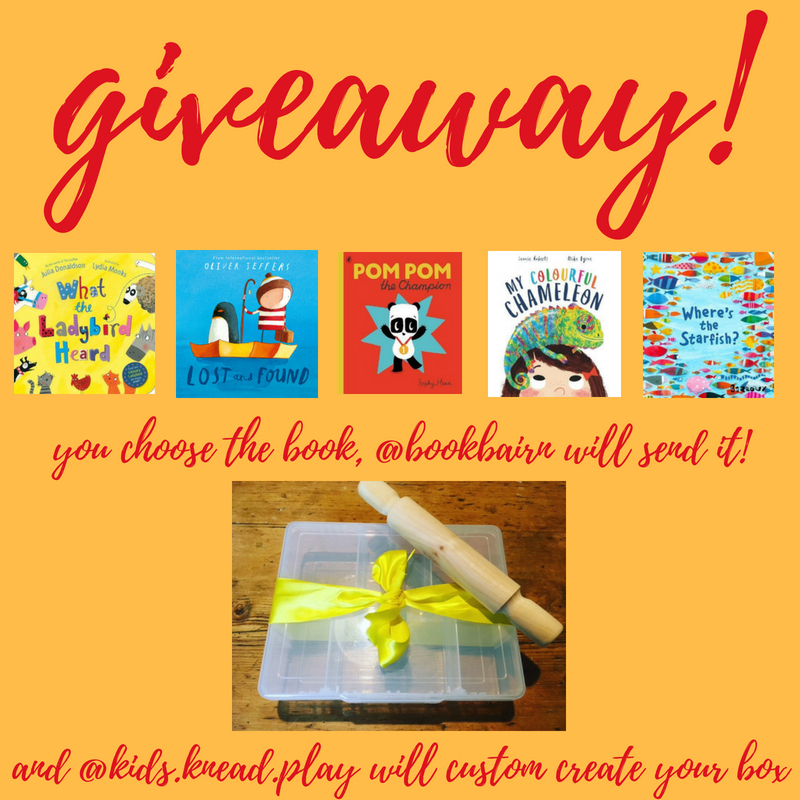 DISCLAIMER: I had bought a Kids Knead Play Box in the past for BookBairn (an Easter themed one) and I reached out to ask if they wanted to work with us by sending us a box for review and working together on the giveaway above. We did receive this box free for review but I will definitely be buying from them again! It's worth every penny to see that awesome playspiration! BookBairn couldn’t wait to show me this. “Shall we play play dough, Papa. Look it’s the Penguin and the Boy”. I really think the author should consider renaming his book. I agree! Or maybe he could write 'the penguin and the girl'? He writes and illustrates incredibly inspiring books!And yes this play dough was super fun!